Upright: “This powerful being brings the force of ancient wisdom and profound healing. The light of Divine consciousness pours from his hands and heart, flowing to you with love and a powerful, healing intention. This amazing entity is with you now, bringing resolution to physical, mental and emotional ills, helping to unblock stuck energy and revitalize your life force. There is no coincidence that the man in this photo resembles Jesus Christ. This is a direct message that he is working closely with you at this time, helping you through challenges and difficulties while also healing you and helping you to be able to receive more love and light into your life. 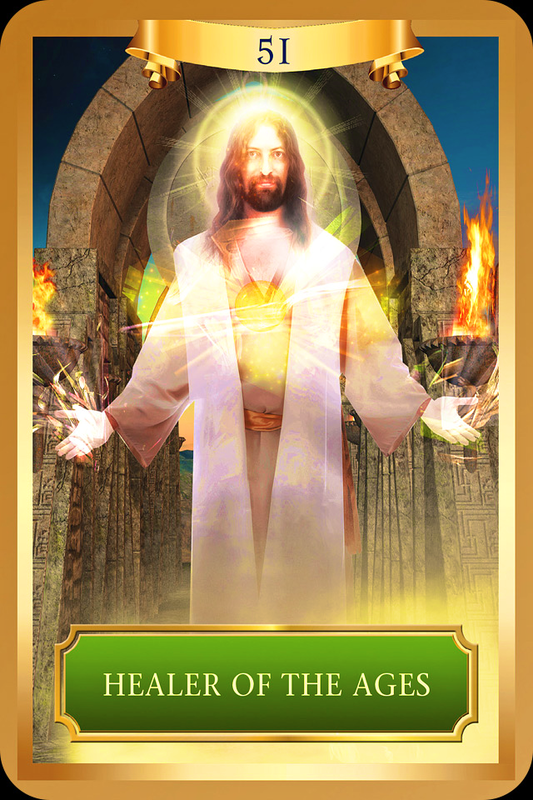 He is the embodiment of the Truth, the Way and the Light, this is pure Source energy working with you now. Send gratitude for the healing that you are receiving at this time. Part of this healing is a healing of our awareness; helping to expand our consciousness in order to be able to comprehend the true meaning of Christ Consciousness. The profound simplicity of which is love and light itself. Notice the golden light emanating from his chest, this is pure love, but it is also a healing for your Solar Plexus Chakra, the seat of personal power. When we are called to follow our Soul’s path, there is often fear of stepping into this power. You are being healed and empowered; attuned to the Universal Wisdom and Cosmic Awareness. This in turn will allow you to see the bigger picture, the one that shows you the important role you play in your connection to All That Is. Take a few moments to breathe deeply and connect to this wonderful and powerful energy being sent to you. See your Healer standing before you in all his glory, surrounded by the light and love that he radiates. See the light coming from his hands, pure and white, all powerful and all healing. Know that there is enough light to heal everyone, that we are all connected, and that by healing yourself, you are also helping to heal every living creature and our beautiful planet. Allow this bright white love and light to flow to you, and through you. See the golden ray of light come from his Heart Center and Solar Plexus to your own, giving you strength and courage to walk your life’s journey; to follow your heart and manifest joy and love into your life. Know with every ounce of your being that you are unconditionally loved, accepted and supported as you create your new reality. One of love; of connection; of healing and of higher consciousness. Send love and gratitude out from your heart, in a beautiful, huge bubble of white light… all the way around the world and out into the Universe. As above, so below.